We have moved to the realm of 2.x!!! Didn't hear any negative feedback from the beta 2.0 version that supports 2019, so we're off to the races. Note 2.x has a breaking change by removing the obsolete options (see obsolete options in documentation below). Automatic Versions is created and maintained by Precision Infinity. ~~Visual Studio 2017 support~~ -- Done! ~~UX and Usability Improvements~~ -- Done! New Supported Project Types (misc) (Partially done. Package Version and Semantic Version completed, next up are manifest updates for vsix files and click once publish version. In the queue for analysis are wix, and xamarin). ~~Startup performance improvement using new VS2017 async capabilities (this might have to be deferred until version 2.0 where the new version will no longer support older versions of VS. For 1.x we're trying to stay backwards compatible).~~ -- Done! Paid support available upon request. Please use the Q&A tab for all bug reports. If you do have an issue, we'd love the chance to resolve it before you post a review. We want the tool to be an awesome improvement to your daily productivity and to always work as you expect. 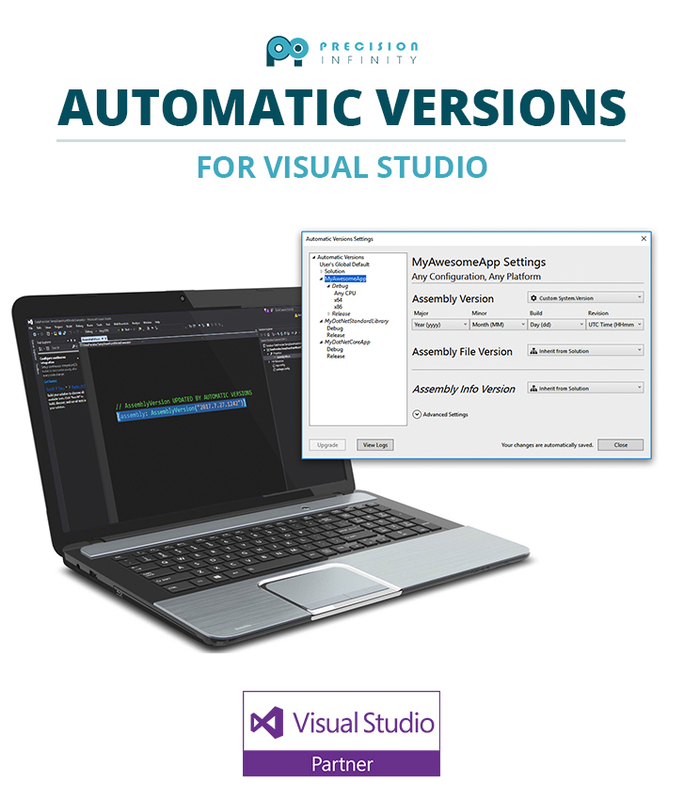 The Automatic Versions plugin is designed to improve productivity by automatically incrementing Assembly, AssemblyFile, AssemblyInfo, ClickOnce, and package version(s) for C# and VB projects for Full .Net, .Net Standard and .Net Core. Settings are configurable as granularly as the at the Configuration (Debug/Release) level of a Project, or more generically at the Solution level, or a global user default for all solutions. Additionally, Regular .Net projects can also have settings at the project level to apply to all configurations. Custom Semantic Version (BETA/PRO) - Allows options for Major.Minor.Patch-prerelease version format (This setting is only available for AssemblyInfo (Full .Net) and Package (.Net Standard/Core). Package Version (BETA/PRO) - (.Net Standard/Core) If set, updates the Package Version attribute and will automatically be used in the nuget package manifest. The only option for this is Semantic Version. The way to get this version in your project is the same as Assembly Info Version. ClickOnce Version (BETA/PRO) - If set, updates the ClickOnce Version to match the AssemblyVersion or AssemblyFileVersion. None w/AutoReset - Lets you set the value manually and will not be changed, unless a more significant number increases, in which case it will reset to 0. UTC Seconds Since Midnight/2 - If you are using a custom unique time based stamp for your version number, this gives you the most granularity to a single day. The number has to be divided by 2 so it doesn't overflow the max value. **This value will overflow in 2065. Since it is very useful and there are limited alternatives that work as well as this one, we are continuing to use it and even recommend using it, however, we may change it's functionality at some point such that it does not overflow in 2065. The overflow itself is not a security issue, however. It will only cause a build error. Semantic Versioning is typically used for 'packaging' the results of a build for use in a manifest file or as a 'published package' of your product. Therefore Semantic Versioning leverages the other version attributes by letting you choose which of those you want to use for your Major/Minor numbers, and independently does it's own incrementation on the Patch and Pre-Release numbers. Patch settings - This will increment the Patch number based on the incrementation settings. Increment Once is available for when you switch to a 'pre-release' version of the product, you will typically want the Patch number to Increment Once for the start of your pre-release cycle. After incrementing once, this setting will automatically update to None (whereby Pre-Release will be doing the incrementation). Pre-Release (optional) - Set to alpha, beta, preview, rc, or N/A (release). If you set a pre-release, then Patch will automatically change to "increment once" for you and the prerelease will increment instead starting with alpha, then alpha-01, alpha-02, etc. When you set this to (N/A release) then Patch will be automatically changed to Increment w/AutoReset for you. AssemblyInfo Location (optional) - Specifies a custom location of the AssemblyInfo class file. The default location is in the Properties folder. Primary Version Type - Setting this option to a value other than None will store the selected attribute's value as a MSBuild property named "AssemblyVersions". This allows developers to use a custom build process without needing to parse the version number from a text file or the AssemblyInfo source file. Each time you build your project, the versioning will automatically change. To use the "On Demand" version options, right click on the project and choose "Build New Version" to increment all "On Demand" settings, or use "Build New Major Version" or "Build New Minor Version" to just increment the settings that have "On Demand" set for Major or Minor respectively. Release Notes (Yes we use Automatic Versions for Automatic Versions, it's meta). Released 2.x version with async load support. Removed the 'Build New Version' context menu in favor of just the more granular 'Build New Major Version' and 'Build New Minor Version' buttons. [AUTOVER-90] - BUGFIX: There was a Bug preventing tool window from showing on projects that did not have an Any CPU config. [AUTOVER-79] - Bugfix to build on depend in relation to dependent projects. This does not give independent control to the on demand feature, that was broken out into a future ticket AUTOVER-88. [AUTOVER-86] - Bugfix: Increment On Demand was causing a reset of Increment (Always) when it shouldn't. [AUTOVER-85] - Bugfix improvement where some cases the clickonce version type might default to AssemblyInfo instead of none. [AUTOVER-71] - New Incrementation option "Seconds Since Midnight/2"
Major Bugfix for solutions settings not saving all configurations. Note on this release: We had heard reports for a long time of users complaining about Automatic Versions not saving their settings, but the descriptions were vague and we'd never been able to replicate until a few weeks ago. This release fixes that issue. For clarification, it would only happen on the solution level and only when you had multiple configurations set. Thank you to any recent users' reporting that gave us a little extra info we badly needed. Minor Bugfix: User reported issue with upgrading in VS Enterprise version. Updated manifest to add support for Enterprise and Community editions. Bugfix: Intermittent freezing of Visual Studio 2015 Update 2 when opening. Added Visual Studio 2015 support. Added support for website projects and projects in solution folders. Added support for displaying error, warning, and informational messages to the Error List and activity information to the Status Bar. Added Primary Version Type for storing the selected version value in a MSBuild property named "AssemblyVersion" in order to better integrate with your existing build processes. Overhauled settings model to handle multiple configurations per project, including support for the new Platform option. Added Increment On Demand w/Reset increment option. Added checks to prevent unnecessary increments for projects. This does not affect the Rebuild or Build New Version commands. Fixed an issue with compatibility for VS2012.